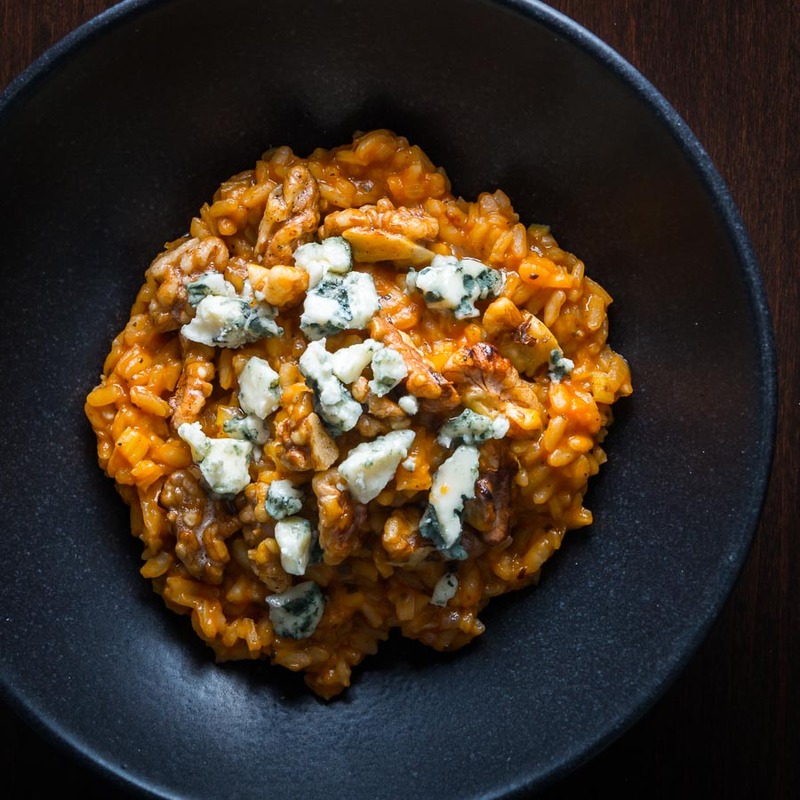 I can’t think of anything more homely than a good risotto and this pumpkin risotto sings with the flavours of autumn and winter! Pureed Pumpkin Risotto with Walnuts. 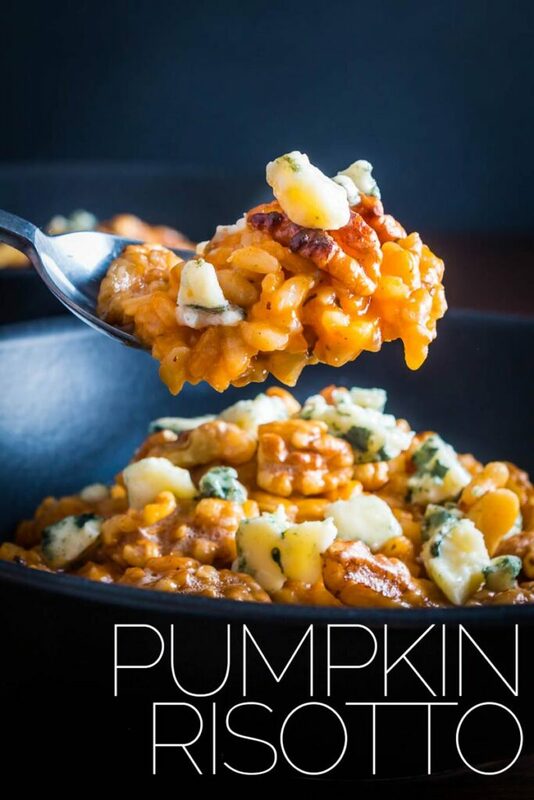 This pumpkin risotto recipe is the second exploring similar ingredient and flavour profiles. Both result in very different recipes. Both hail from Italy, well kinda… and both of them rely on pumpkin puree as their foundation. Cooking is really simple. It is nothing more than a series of techniques which can all be learned. Then a set of flavours and textures that work well together. You can play those ideas together in the same way music takes chords and notes to form riffs. Food is rarely innovative or new, but reworkings of things that make our bellies and taste buds go, mmmmmm. Anyway back to this pumpkin risotto. Just like my earlier pumpkin gnocchi recipe works with my favourite pumpkin buddies, blue cheese, and nuts. However, this time around I am working with walnuts and blue cheese. If your house is anything like mine you will definitely have some blue cheese and nuts lying around at this time of year so why not do something new with them? I was never all that keen on pumpkin growing up. In fact, all of my pumpkin recipes are relatively new additions to my cooking repertoire. I think I was largely put off for many years by its use in so many sweet recipes and over-reliance on something called ‘pumpkin spice’. But the earthy sweetness works a treat in savoury recipes. Whilst I am on the topic of spice. 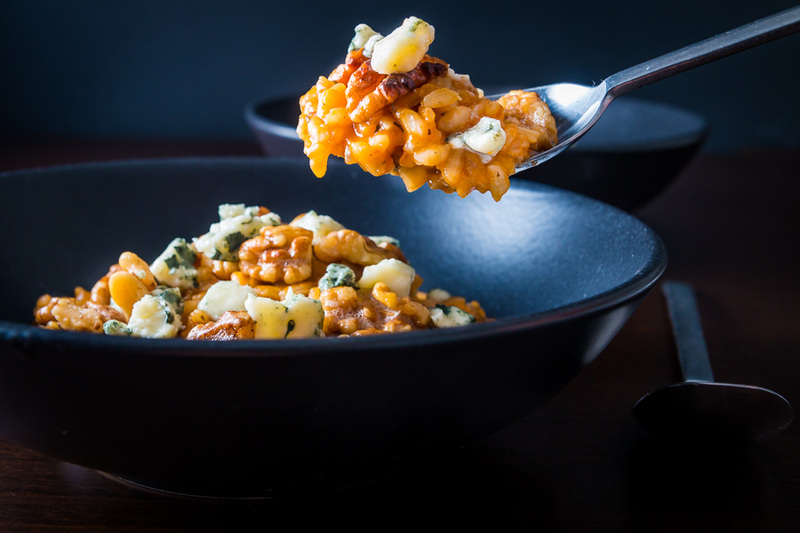 Pumpkin really does take well to a little bit of heat as well as classic European flavours in this pumpkin risotto recipe. Check out my easy pumpkin chili recipe or Burmese pumpkin curry recipe. Both of which really highlight a slightly different spicing with pumpkin that work really well. Cooking The Perfect Risotto Is Easy. Like all risotto recipes this does take some time but no skill. If you can stir you can make risotto, the secret is patience and nothing else. I have seen all sorts of foolproof shortcut risotto recipes and they always confuse me a little as to why they exist. This pumpkin risotto is foolproof. All traditional risotto recipes are foolproof. It does not matter whether you are cooking this pumpkin risotto, my pea and ham risotto or my spinach and mushroom risotto, the technique is the same. Add stock a little at a time and stir whilst liberally lubricating your stirring arm with wine and keeping your head clear with good music. Keep stirring until rice is cooked, I’m not sure it gets any more simple than that. It would be rude of me not to say thank you all for sharing my kitchen with me this year. It has been a thrill to read your comments here and on my other social media streams and I look forward to more of the same over the coming year. Heat the vegetable stock to a slow simmer. In a large frying pan heat the butter over a medium heat and then add the onion and celery and cook for 10 minutes until softened. Add in the rice and garlic, then stir until the grains become translucent at the edges. Turn up the heat to medium high and add in the white wine and stir until all of the wine has disappeared, then add in the dried sage. Now you need to slowly stir in the hot vegetable stock a ladle full at a time, stirring continually, making sure all of the stock has been incorporated each time and the pan is dry. Repeat this until all of the stock is incorporated and the rice is cooked with a very slight bite which should take between 25 and 35 minutes. Now stir in the pumpkin puree and bring to temperature, then place on a lid and allow to rest for 5 minutes. Whilst the risotto is resting take the extra 25g of butter and melt in a separate pan and use it to toast off the walnuts. 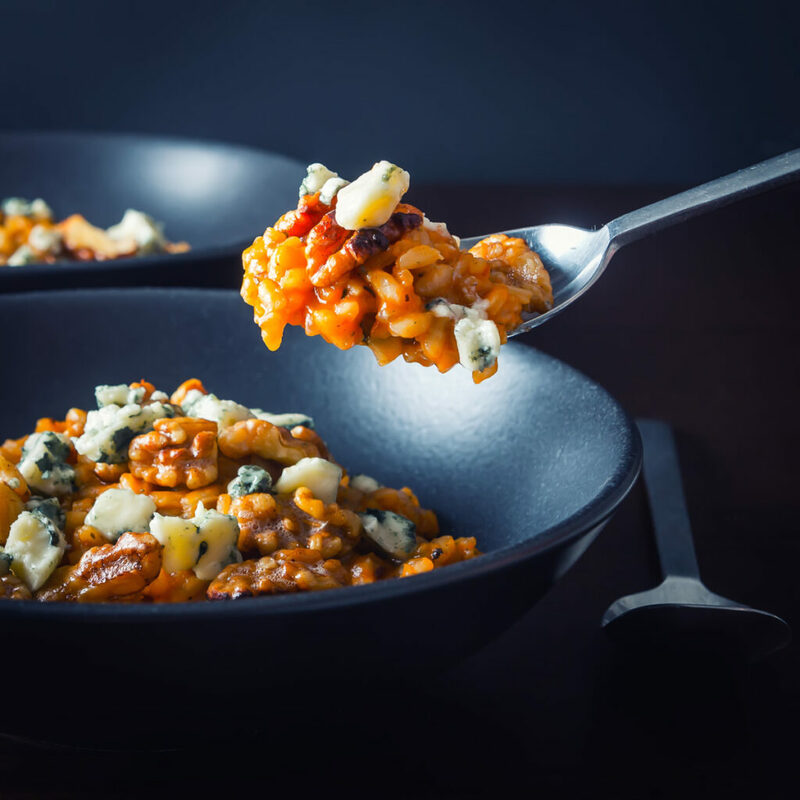 Serve the risotto with the butter toasted walnuts and crumbled Roquefort cheese. Making Pumpkin Puree is simple, cut your pumpkin in half, scoop out the seeds and then rub the oil into the cut face of the pumpkin, sprinkle over the salt and roast for an hour and a half or until soft at 200°C. Allow to cool and pass through a vegetable mill. This is delicious. I’m a huge fan of pumpkin risotto. You have inspired me to make this ASAP. It’s such a great fall meal! Your ingredients do not say how much Sage to add. It also does not say when to add the garlic. Really love the colours in this risotto and walnuts and blue cheese are such a great contrasting combination. This looks so tasty! I think the combination of the walnuts, pumpkin and blue cheese sounds like a real winner. This pumpkin risotto looks lush Brian I absolutely love the idea of adding blue cheese Roquefort in particular( I love it )and the walnuts. What an addition! Brilliant and I will definitely make this. Kids and hubby would love it . Thanks Ramona, it certainly is a wonderful warming dish with great flavours! Hey! Thanks for sharing this recipe! We prepared it yesterday with minor adaptations and were excited – this bright orange color, blue-white cheese and crunchy nuts. We translated it to german and wrote it down. Substitutions are what make the food word go round 😀 Fill yor boots would love to hear what you come up with. 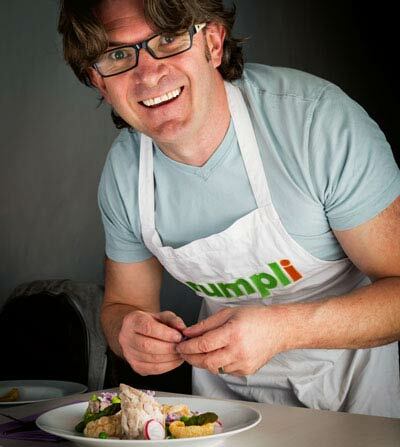 Love how you describe cooking and food… “Cooking is really simple, it is a series of techniques which can all be learned and then a set of flavours and textures that work well together, then you can play those ideas together in the same way music and takes chords and notes to form riffs. Food is rarely innovative or new, but reworkings of things that make our bellies and tastebuds go, Mmmmmmm.” So true! This pumpkin risotto is made with a lot of love and care. Looks so comforting and delicious! Thanks Lindsay, it sure is a favourite in our house. Wow! I took one look at this risotto and seriously wished you were my next door neighbor. You’re right about it just taking a little time and patience — I like the music aspect… and I would add a glass of wine to sip— tee hee! Risotto is high on my comfort food list – will have to give this a try! Spectacular photos, btw. This looks just luscious, what a lovely risotto!